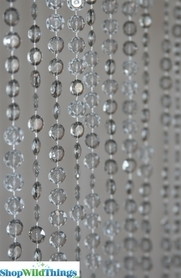 Crystal Beaded Chandelier "The Whirl" with Smoke Gray Beads and Whitewashed Matte Black Metal Finish. Light Kit Included or Use as Tabletop Centerpiece Chandelier. 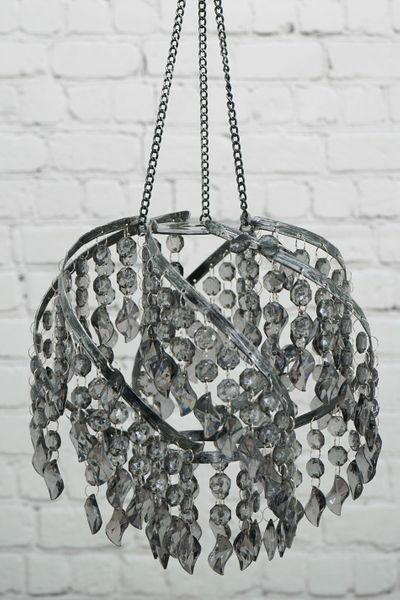 Our Whirl Chandelier has a 9" in diameter and 9" tall spiral frame, but one of the best features is that the finishing beads on each crystal strand also have a unique whirling twist! Full of charm, this chandelier weighs 2 lbs., has an 11" long hanging chain with hook and comes with a 12' long, white light cord kit with an on/off rocker switch. The socket holds a 75W max, E12 Candelabra style bulb (bulb not included). This chandelier is totally hand-beaded and the clarity of the beads is beyond outstanding! They actually look like glass! All of the high-end acrylic beads are faceted on both sides and they're so shiny, even without a light source. The metal frame has a whitewashed matte black finish and the center of the chandelier is configured to hold the light kit or you can simply use this cutie as a hanging decoration without the kit. Please watch the video to see how to attach the light kit. You'd prefer a table chandelier? The Whirl makes an elegant centerpiece or table lamp and is so attractive it really doesn't need a light source! 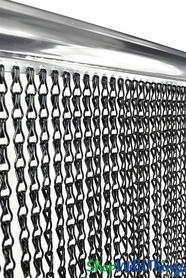 Carefully remove the hanging chain and choose a Boost or Elevate Centerpiece Riser Kit which range from 14" to 39" tall. These risers are inexpensive and turn a hanging chandelier into a tabletop version! There are several ways to light this tabletop chandelier and even though the beads are smokey gray, LED lights will change the overall look and feel of this chandelier due to the high quality material and the faceted sides. You can put LED submersible lights in the riser kit itself and/or use LED Light Discs to up light or downlight the chandelier. The top frame is 3 1/4" in diameter and the bottom frame is 2 3/4" in diameter. Both will hold a remote controlled light disc from 2 3/4" to 4" in diameter. For a more subdued lighting effect, place a Dazzled Submersible LED Light upside down on the top frame. The compact size makes this ideal for a small apartment, a dorm room or an office cubical. You can also use as garden decor by hanging from a Shepherd's Hook! Hanging or Tabletop, The Whirl Chandelier is very versatile, always ritzy and totally appealing!